The Hyundai Creta facelift will come with a bunch of visual updates like a new grille, revised headlamps, new bumper and updates interior. We expect the SUV to be launched soon. 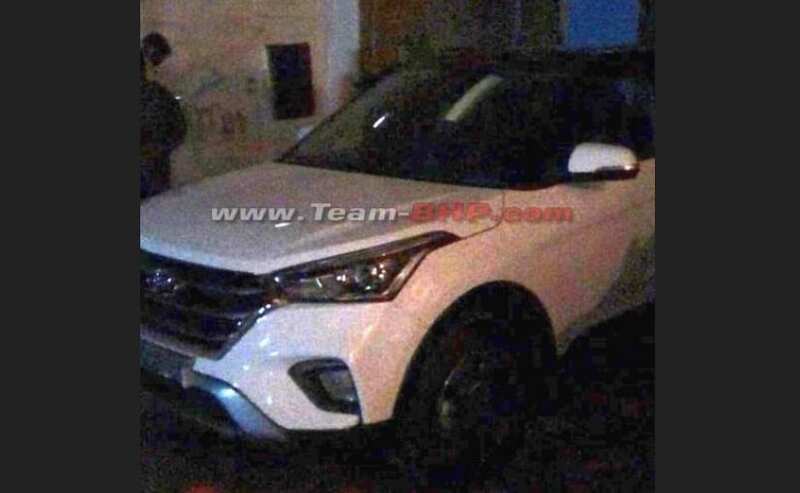 The 2018 Hyundai Creta facelift is all set to be launched in India this year and recently a production version of the SUV was spotted sans camouflage. While the image is not all that clear, there are certain visible cosmetic changes that indicate that this is, in fact, the facelifted Creta. This is the first time that the SUV has been spotted without any camouflage, and judging by the image, we now know that there are plenty of cosmetic changes. It's said that the image was taken during an ad commercial shoot, which would indicate that the launch is imminent. Visually, the 2018 Hyundai Creta will come with a new, larger cascading grille with horizontal chrome slats, flanked by a revised set to headlamps with reworked cluster design and integrated LED daytime running lamps. The Creta facelift also comes with a redesigned front bumper with restyle foglamps, and bull-bar-like design element running over new central airdam. The Creta facelift will continue to come with the plastic cladding for the wheel arch and underbody, and the SUV also appears to come with a new set of alloy wheels. The SUV also features a pair of redesigned ORVMs, with integrated LED turn signal lights and dual tone body colure with black roof and pillars. We do not get to see the rear portion of the SUV in this image, but based on some of the earlier seen spy images, we know that the facelifted Creta will come with redesigned taillamps, rear bumper and tailgate as well. The cabin will also come with some considerable amount of changes, possible an updated dashboard, new touchscreen infotainment system, improved safety and convenience features and more. Under the hood, the 2018 Hyundai Creta facelift will most likely continue to offer the existing pair of 1.6-litre petrol and diesel engines, along with the smaller 1.4-litre diesel engine. Transmission duties will also continue to be handled by a 6-speed manual gearbox as standard, along with a 6-speed automatic torque converter that comes as an option for both the 1.6-litre petrol and the 1.6-litre diesel engine.